Since 1997, Cottages on the Web has set the bar for other cottage rental websites through cutting edge development, extensive marketing, and convenient and thorough customer support. Our website advertises privately-owned cottages, resorts and vacation properties, either for rent or for sale. All of the properties listed on our website are located in Canada and the United States. Whether you own a vacation property, or are looking to rent or buy, we are your web marketing solution. 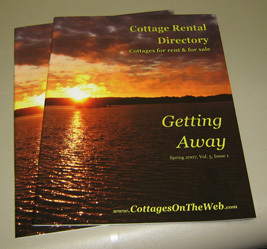 Thanks to Cottages on the Web, it has never been easier to advertise your cottage for rent or for sale. We've carefully developed an outstanding, advertising system that allows you to register, login and start adding listings right away. Your vacation property can be up on the web for the world to see within minutes. Our office is located in beautiful Huntsville, Muskoka, Ontario. Our staff consists of knowledgeable and experienced cottage owners, cottage vacationers, web developers, marketers and customer service representatives. If you have any questions, comments or feedback regarding our services, please contact us for more information. Thank you very much for being one of the millions of visitors to log onto our website since its creation.